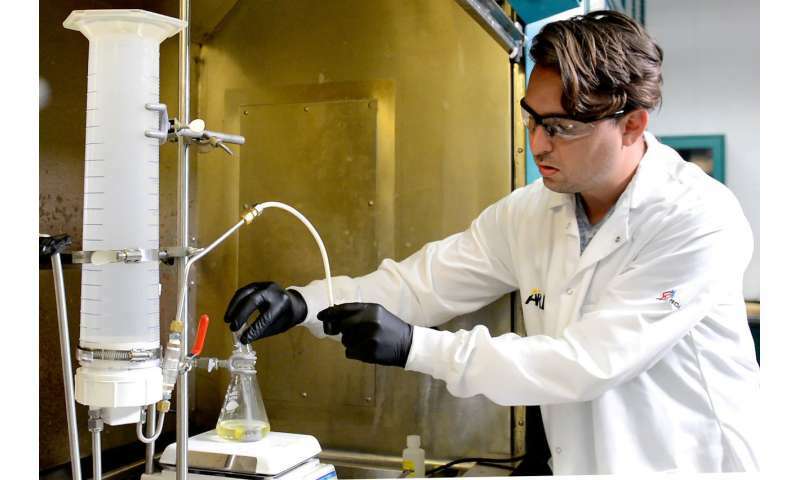 The U.S. Army Research Laboratory plans to license its discovery of a nanogalvanic aluminum powder for hydrogen generation. Army researchers have developed a novel, structurally-stable, aluminum-based nanogalvanic alloy powder that, when combined with water or any water-based liquid, reacts to produce on-demand hydrogen for power generation without a catalyst. "This powder-based alloy includes material that disrupts the formation of an encapsulating aluminum oxide layer, allowing for the continuous production of hydrogen that can be used at the point of need to power a wide range of devices via fuel cells and internal combustion," said Dr. Anit Giri, a scientist with the lab's Weapons and Materials Research Directorate. "The powder can be easily manufactured to scale, and can be conveniently and safely transported via tablets or vacuum pouches, thus eliminating reliance on high-pressure hydrogen cylinders." ARL will be posting a Federal Register Notice and launching a supporting website inviting companies to submit their ideas on how best to commercialize this technology. The laboratory will then select the most appropriate partners and collaborators. Officials said license exclusivity will then be determined. "The Federal Register announcement is a significant step forward in the transition of power to the Soldier in the field, where it will become available on-demand at the point of need," Dowding said. Army researchers discovered the unique properties of the nanopowder while investigating aluminum alloy compositions for other purposes. The researchers, from the lab's Lightweight and Specialty Metals Branch, made the serendipitous discovery that at least one of these compositions can, in the presence of water, spontaneously generate hydrogen, rapidly and efficiently. 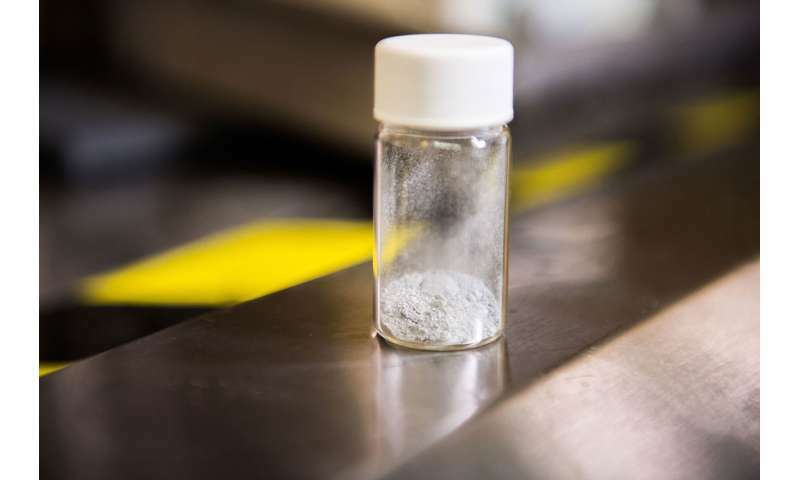 "The researchers have since demonstrated rapid hydrogen generation rates using powder and tablet forms of the alloy," said Branch Chief Robert Dowding. "The hydrogen has been shown to be useful for powering fuel cells and is expected to power internal combustion engines." The researchers are currently taking advantage of the innovation by characterizing the hydrogen generation rates and purity of the gas generated, Dowding said. "They are also examining the effects of compositional changes to the alloy and systematic changes in the microstructure of the powders," he said. Giri said the discovery has many benefits and applications, such as simple manufacturing. "The powder can be made using current manufacturing techniques from either pure or alloyed aluminum," he said. "The manufacturing process is easily scalable and it is also very fast—with a 75-percent theoretical hydrogen yield in one minute at standard temperature and pressure, and 100-percent theoretical yield in three minutes." The nanopowder is also extremely efficient. Giri said 1kg of powder can generate 4.4kWh of energy—enough to power 10 60-watt incandescent light bulbs for more than seven hours or the equivalent LED bulbs for over 50 hours. The material can be in powder or tablet form and be combined with any available water-based liquid to provide hydrogen on demand, at the point of need. The discovery eliminates reliance on high-pressure cylinders, Giri said. "It's easy to transport and store via tablets or vacuum-sealed pouches with no inherent inhalation risk," he said. "The powder is also environmentally friendly. Its by-products are stable and non-toxic. Finally it's a versatile hydrogen source with direct combustion for vehicular power, to use in fuel cells to power any electronic device, and could potentially be used in 3-D printing/additive manufacturing to create self-cannibalizing robots/drones." In order to support a better understanding of the material, the laboratory established a website to showcase details on the technology and a review process that will culminate in the granting of a patent license(s) around September 2018. On this website, visitors can register their interest to be contacted about further developments, post general questions and download background technical information, as well as templates for all the required documents that will be used throughout the process.